Quick reference for some frequently used Git commands. git fetch fetches branches and/or tags (collectively, refs) from one or more other repositories, along with the objects necessary to complete their histories. Remote-tracking branches are updated. The names of refs that are fetched, together with the object names they point at, are written to .git/FETCH_HEAD.This information may be used by scripts or other git commands, such as git-pull. The FETCH_HEAD is just a reference to the tip of the last fetch, whether that fetch was initiated directly using the fetch command or as part of a pull. This command will fetch only the master branch. The remote.<repository>.fetch values determine which remote-tracking branch, if any, is updated. git merge incorporates changes from the named commits (since the time their histories diverged from the current branch) into the current branch. Then git merge topic will replay the changes made on the topic branch since it diverged from master (E) until its current commit (C) on top of master, and record the result in a new commit (H) along with the names of the two parent commits and a log message from the user describing the changes. Before performing any merge, we should make sure our codes are in good shape and commit all local changes. git pull and git merge will stop without doing anything when local uncommitted changes overlap with files that git pull/git merge may need to update. Often the current branch head is an ancestor of the named commit. This is the most common case especially when invoked from git pull: we are tracking an upstream repository, we have committed no local changes, and now we want to update to a newer upstream revision. In this case, a new commit is not needed to store the combined history; instead, the HEAD (along with the index) is updated to point at the named commit, without creating an extra merge commit. A merged version reconciling the changes from all branches to be merged is committed, and our HEAD, index, and working tree are updated to it. It is possible to have modifications in the working tree as long as they do not overlap; the update will preserve them. Paths that merged cleanly are updated both in the index file and in our working tree. For conflicting paths, the index file records up to three versions: stage 1 stores the version from the common ancestor, stage 2 from HEAD, and stage 3 from MERGE_HEAD (we can inspect the stages with git ls-files -u). The working tree files contain the result of the “merge” program; i.e. 3-way merge results with familiar conflict markers <<< === >>>. No other changes are made. In particular, the local modifications we had before we started merge will stay the same and the index entries for them stay as they were, i.e. matching HEAD. If we tried a merge which resulted in complex conflicts and want to start over, we can recover with git merge --abort. Decide not to merge. The only clean-ups we need are to reset the index file to the HEAD commit to reverse 2. and to clean up working tree changes made by 2. and 3.; git merge --abort can be used for this. More precisely, git pull runs git fetch with the given parameters and calls git merge to merge the retrieved branch heads into the current branch. See the More about config variables for more details. Normally the branch merged in is the HEAD of the remote repository, but the choice is determined by the branch.<name>.remote and branch.<name>.merge options. If we tried a pull which resulted in complex conflicts and would want to start over, we can recover with git reset. 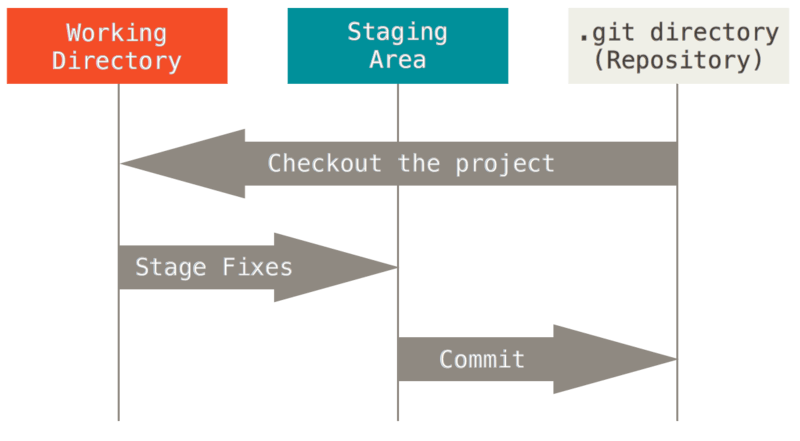 Tutorials(here and here) for git rebase. Follow this stackoverflow answer to change the author name/email for a specific commit. When on branch <name>, it tells git fetch and git push which remote to fetch from/push to. Defines, together with branch.<name>.remote, the upstream branch for the given branch. It tells git fetch/git pull/git rebase which branch to merge and can also affect git push (see push.default). When in branch <name>, it tells git fetch the default refspec to be marked for merging in FETCH_HEAD. When on branch <name>, it overrides branch.<name>.remote for pushing. It also overrides remote.pushDefault for pushing from branch <name>. When we pull from one place (e.g. our upstream) and push to another place (e.g. our own publishing repository), we would want to set remote.pushDefault to specify the remote to push to for all branches, and use this option to override it for a specific branch. The remote to push to by default. Overrides branch.<name>.remote for all branches, and is overridden by branch.<name>.pushRemote for specific branches. Disclaimer: This is my personal notes for Git reference. Some of the notes come from my daily experience and some come from other existing Git tutorials or documentations.